Call it what you will but the President's three-day bus tour of the Midwest sounds like he's warming up for 2012. The issues farmers and all of America face today aren’t about failures of government but rather a failure of politics. That's the message President Barack Obama delivered to a welcome crowd during a town hall meeting in Cannon Falls, Minn. today. The event, which kicks off a three-day bus tour through Minnesota, Iowa and Illinois, features stops that will focus on key rural issues. At this first stop, a warm up speaker – Tom Vilsack, secretary of agriculture – delivered the message Obama-inspired programs were creating jobs including the broadband initative aimed at connecting rural areas. Vilsack notes, that the investment there will impact 325,000 businesses. 'TOWN HALL' was actually in a park in Cannon Falls, Minn., and the intimate setting allowed the public to ask the President a wide range of questions. He didn't shy away from the answers working to explain the healthcare program and other work his administration has accomplished. "With broadband we can connect rural areas with the rest of the world," Vilsack says. "That includes farms, businesses, hospitals and schools." 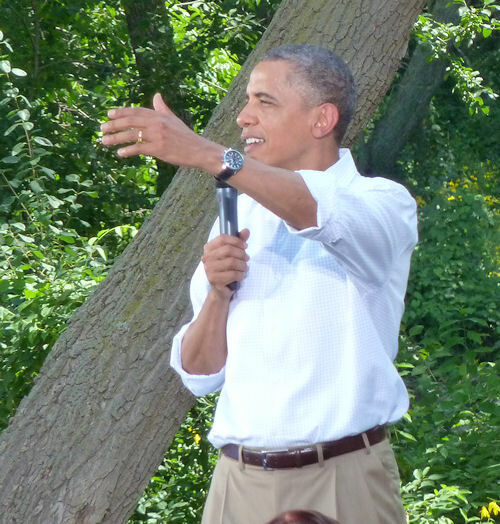 During his talk, Obama touched on the broadband investment noting that his administration is trying to connect 98% of America so that every town will be linked. The initiative is impact a wide range of businesses. As Obama started his talk he focused on the rise of biofuels as a way to boost the American economy. "The fact is that technology is improving," he says. "We're using refuse and other materials not used for food to create energy and we're backing that up with the purchasing power of the government." In fact, the Department of Defense is testing biofuels for broader use, he notes. During his opening remarks, Obama noted that a few actions could be taken now to get America on track including a renewal of the payroll tax credit – a controversial move not favored by Republicans. Obama notes Congress has the power to put that money into consumers' pockets to stimulate the economy now. He notes a need to "start rebuilding America" adding that the housing bubble caused a lot of trouble and there are a lot of construction workers out there who could be at work on roads and bridges. "The Infrastructure Bank would involve private investors in the building of new bridges and roads," he adds. Another point, is the idea of incentivizing businesses to hire veterans. "This is something that Congress can do now," he says. As for trade deals. Obama walked through the free trade agreements sitting in Congress. "Trade deals have not always been good and at times we've not gotten a fair deal," he notes. "But we want to sell Chevy's and Fords in Korea as they sell their cars here," he notes. The FTAs are stalled due to provisions from the Obama administration that are still being worked out, however they would be job-stimulating agreements if passed. "There is no shortage of ideas to put people to work now, but we need to put partisan games aside," Obama says. He notes that government isn't broken but politics is and points to the fact that government is the teacher, the policeman, the FEMA worker and others that get the work done. "Let's not confuse what government is," Obama notes. The President didn't leave all the comments on the other side of the aisle either, noting that some in his party say no government program can be changed. "That's ridiculous, every company looks at what it does every year looking for improvement," he adds. Whether this is the official kickoff of Campaign 2012 for Obama is for the pundits to decide, for the folks of Cannon Falls, in the national spotlight for an hour today, the news was good and Obama inspired those on hand with his message. Of course, where Congress is when the fall recess ends remains to be seen.